This entry was posted in Development and tagged Adobe AIR, Flex, Inside RIA, Static Code, Universal Mind on May 16, 2008 by adamflater. 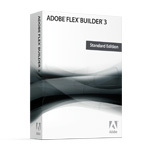 This entry was posted in Development and tagged Adobe AIR, Flex, Inside RIA, Learning Flex From Scratch, Universal Mind on April 10, 2008 by adamflater. This entry was posted in Development and tagged Adobe AIR, Flex, Inside RIA, Learning Flex From Scratch, Universal Mind on April 4, 2008 by adamflater. This entry was posted in Development and tagged Adobe AIR, Flex, Inside RIA, Learning Flex From Scratch, Universal Mind on March 12, 2008 by adamflater. This entry was posted in Development and tagged Adobe AIR, Flex, Inside RIA, Learning Flex From Scratch, Universal Mind on February 29, 2008 by adamflater.